I encountered this "mutant" wild turkey that apparently has four legs. Now, if we can only cross-breed one of these with domestic fowl, we will have more drumsticks than we can shake a fork at. 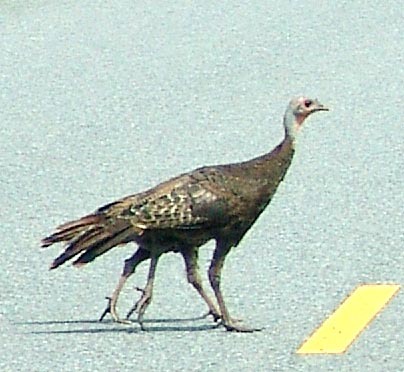 This was an adult turkey guiding a flock of young turkeys across the Blue Ridge Parkway and one of the little ones must have been directly behind her. All in all there were about 15 young turkeys in the flock and her family procession stopped traffic for a few minutes. This is just the tail end of the procession and momma is bringing up the rear. As the young turkeys made it to safety, the female turkey arched her back and slowly strutted the last few steps across the Parkway. It made a grand finale to the procession. 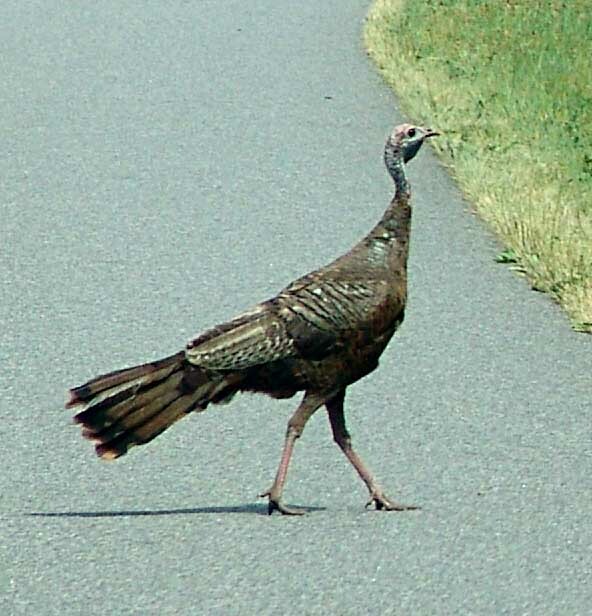 This entry was posted in Seen around Floyd and tagged Blue Ridge Parkway, wild turkeys. Bookmark the permalink. November must be approaching if the turkeys are leaving town? Are these the original native turkeys? And if so, how did they transmogrify into the fat beasts that we eat today, I wonder? I know you’re a wizard with your PHOTOSHOP, but this is your best work. Four legs, right. Neat photo. The shadows below the birds give it away as two separate birds. I am guessing the second bird had its head drawn over in photoshop because there are blending lines on the concrete if one looks carefully. Though the image blending tool mentioned on slashdot a week or so ago would have made the image perfect. Thanks for your interest in our turkeys. The explanation for the four legged appearance was contained in the article. No Photoshop was required to make this picture, only great timing and a camera ready for use. You’re good. Sorry we doubted you. Good eye, David! I see so many wonderful sights on the Parkway but it’s often hard to get my camera out in time. The first time I saw wild turkeys here, I was in my yard and a flock flew by low to the ground. The sound was large and for a second I thought I was seeing pterodactyls! I was a prehistoric moment. “Thank you for your interest in our turkey” could be the intro to US The President’s Website. Is it? I encountered a four legged turkey/duck last night/this morning while cutting up the leftovers of my fowl I had cooked all evening. I didn’t notice them while I washed the bird or basted it. It was only to my surprise when I was cutting the meat to be saved for today’s lunch that I discovered a third leg. I already had cut off both of the drumsticks from the turkey and they were in the bowl, when I made my strange discovery on what remained of my beautiful bird. I told my husband, Stewart, who did not seem as shocked as I was. Then, I called my parents because I knew they would be awake around midnight. My dad answered the phone a little groggy, but he soon woke up when I told him the story of my turkey having three legs. But, again I was surprised . . . there was not only a third leg but a fourth as well. My dad said that my mom wanted to speak to me, so I told her of my findings; she laughed. She works in the poultry industry and was not surprised at all at my four legged friend. She told me that other fowls will mate if they are given the opportunity. While speaking to my mother, I discovered that one side was turkey, but that the other appeared to be duck. Oh my gosh!! Should we eat the leftovers? i had one tonight…it was wierd, wasn’t sure if they were the base of the wings or what.